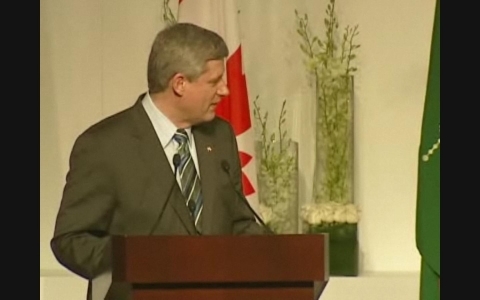 Speech by PM Harper at the Foundation of The Wynford Park Complex - 2010-05-28 | Ismaili.NET - Heritage F.I.E.L.D. “Good morning/afternoon, ladies and gentlemen. Greetings, your Highness. Greetings also to my friends and parliamentary colleagues, Ministers Jason Kenney, Bev Oda, John Baird and Senator Vim Kochar, and to senior members of the Ismaili community. I am very pleased to be here for the Foundation Ceremony for the Aga Khan Museum. “Your Highness, on behalf of the Government and people of Canada, and especially Torontonians, I want to thank you and the Aga Khan Development Network for choosing Toronto as the site for the Museum. Like the beautiful Delegation of the Ismaili Imamat you built in Ottawa, the Museum and the gorgeous formal gardens and Ismaili Centre that are to accompany it promise to be another stunning addition to Canada’s growing array of architectural treasures. “Even more exciting are the proposed contents of the Museum, a rich repository of art and artefacts tracing the evolution of Muslim culture through the ages. It will be a grand destination for Muslim visitors from across Canada and around the world, and it will introduce Canadians from other faith and cultural backgrounds to the compelling history of Islam, one of the world’s great religions and the inspiration for countless major advancements in art, science, music and philosophy. In this, it will serve Your Highness’s lifelong mission to promote pluralism, peace and tolerance through the expansion of knowledge and understanding. The importance of this work, in a world divided by sectarian strife that subjects millions of innocent people to violence, oppression and poverty, cannot be overstated. “As we saw only this morning, in the shameful attack on two mosques in Pakistan, the fruits of hatred are always the colour of blood. The Government of Canada condemns in the strongest terms these vicious murders. And this reminds us again why the work of the Aga Khan, and our own values of toleration for people of differing religious beliefs, are so important. “The Museum will complement the activities of the Global Centre for Pluralism in Ottawa, a partnership of the Aga Khan Development Network and the Government of Canada, which is dedicated to the promotion of ethnic, cultural and religious interchange, education and harmony. And the Ismaili Centre here, is a symbol of how the Canadian Ismaili community has integrated into Canadian society, a mark of Canadian pluralism at its best. “Your Highness, there are no superlatives to adequately describe the admiration Canadians have for the work that you and your organizations do in the service of pluralism, peace and development around the world. You truly inspire our own hopes for a better world. We Canadians are rightly proud of the fact that we have built one of the most ethnically and culturally diverse and harmonious societies on earth. This achievement is rooted in our founding values: freedom, democracy, human rights and the rule of law. “But it’s also rooted in our unique history and the heroic agreements our founding peoples made to acknowledge and accommodate their diversity. As you yourself have said, your Highness, and I quote, ‘We cannot make the world safe for democracy unless we also make the world safe for diversity.’ If I may say so, sir, you sound like a Canadian. And in fact, you are. On June 19, 2009, our House of Commons voted unanimously to bestow Honourary Canadian Citizenship on His Highness the Aga Khan. This is, if I may say, a richly deserved honour.